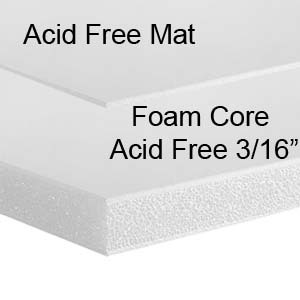 Bainbridge artcare acid free foam core and Crescent select 4 ply mat board. 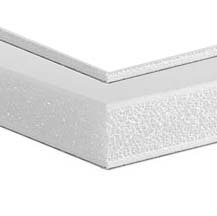 This combination is what we use for the highest level of preservation in our frame shops. A museum with a very valuable piece might wish to substitute a 100% rag (cotton) mat board in place of the alpha cellulose archival board. Tradition and hundreds of years of experience have demonstrated the long lasting nature of cotton papers; however the Library of Congress has tested the alpha cellulose boards and lists them as a fully archival board. The Crescent select boards have also passed the Photographic Activity Test P.A.T. The largest size this can be ordered is 40x60. We do not have acid free mats larger than this size.